Marcus Kemp (right) secured an impressive win in the 3200m race at the Arcadia Invitational. Canada's Marcus Kemp headed south of the border to test himself against many of the USA's top distance runners at last weekend's Arcadia Invitational in California. 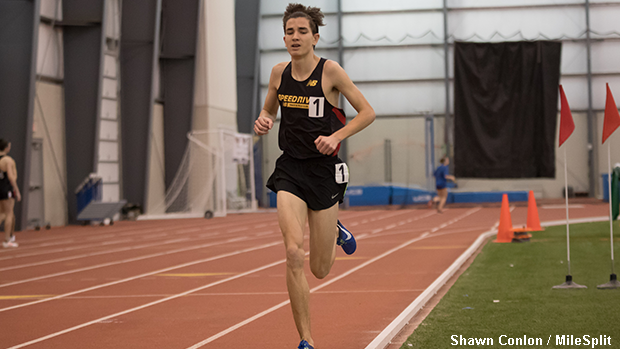 The senior from St. Mary's High School in Kitchener, Ontario made a statement, as he claimed the 3200m race win with his outstanding time of 8:50.95. 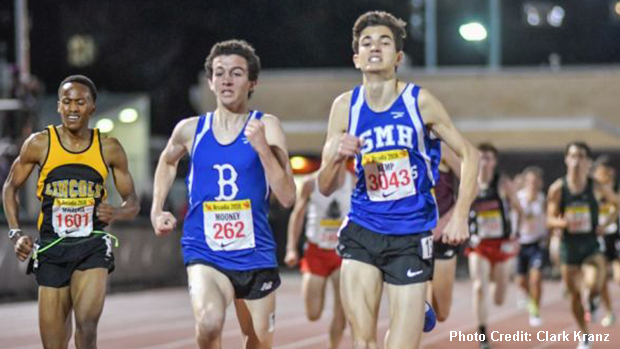 In a spirited battle down the stretch, Kemp out-kicked highly regarded athletes Michael Mooney (CO) and James Mwaura (WA), who finished second and third with times of 8:50.96 and 8:51.62, respectively. The high quality contest saw the top sixteen runners break the elusive nine minute barrier. This wasn't Kemp's first impressive showing on American soil, however, as the Providence College signee traveled to Geneva, Ohio this past February and won the 3200m event at the SPIRE Showcase against a number of top athletes from the Midwest. MileSplit tracked down Marcus to discus his impressive performance at Arcadia and to inquire about his future running-related goals. What were you expecting entering the race? Did you have a time goal and a placement goal in mind? I really didn't know what to expect because it was my first outdoor race and there was such a talented field of athletes, none of whom I had raced against before. I guess I was hoping to finish in the top three and to run low 8:50s, but I really didn't know. I knew I had to get out fast because there were so many people in the race. I focused on hanging with the top ten guys and with a lap to go, I felt good so I made my move to try to win the race. I took the lead with about 250m to go and I was able to just hang on at the end. Michael Mooney pushed me right to the line and he ran a really good race. Did you face any adversity that you had to battle through? There was a big pack of great runners, so there was lots of bumping, pushing, surges etc. I also got spiked pretty well. Everyone in the race was fast and we went out slowly so the pack was even bigger than it would normally have been. I found it a bit hard to maintain my position because of all of the jostling. Did you execute your pre-game race plan? Yes, for the most part everything went as planned but there were a few times where I had to put a surge in or I got boxed in but in the end everything worked out. I was really happy with the result. To be able to beat such a quality field and run 8.50 off a relatively slow pace was awesome. Did you specifically work with any of the other athletes within the race? No, I didn't know any of the other athletes because I've only raced one other time in the United States, but I did speak to one competitor while we were waiting for the race and it happened to be Michael Mooney who came 2nd and finished 1/100 second behind me. Marcus Kemp has big goals in mind for the 2018 outdoor campaign. What does the rest of your outdoor season look like? Do you plan to compete at New Balance Nationals Outdoor? My high school track season begins in May. We run four consecutive weeks, culminating with the Ontario Championships (OFSAA). My goal is to win OFSAA, but it will be tough. There is a really strong group of runners in Ontario right now, several of whom will be competing in the NCAA next year. After high school track is done, my focus will be to try to qualify for the World Juniors in Finland. In order to make the team, I need to run under 3:48 in 1500m or 8:15 in the 3000m and be one of the top two Canadians in the event. My 3200m time works out to fairly close to 8.15, however, it is tough to find fast 3000m races as the older athletes tend run 5000m instead. I may focus on the 1500m, but I will need to talk it over with my coach (Jeff Haller). What are your thoughts about competing for Providence College next year? I'm very excited to have an opportunity to run for Coach Treacy and Coach Brock. Coach Treacy works with some of the top athletes in the USA and I'm looking forward to training with him. Providence has a young, talented team that I'm excited to join. What competition-based goals would you like to accomplish in college? Honestly, I'm not sure exactly what to expect. The NCAAs are huge and there are talented athletes from all around the world. There have been a lot of Canadians who have been successful in the NCAA, so I'm hoping to do the same. I'm looking forward to training hard with the guys from Providence and I would love to win NCAAs someday.